Antique Shows - The Old Town Arts & Crafts Guild, Inc. A non-profit organization. Gallery, Gift Shop, Art Classes, Artists' Receptions, Promoting Art Fairs, and a Historical Art Collection! 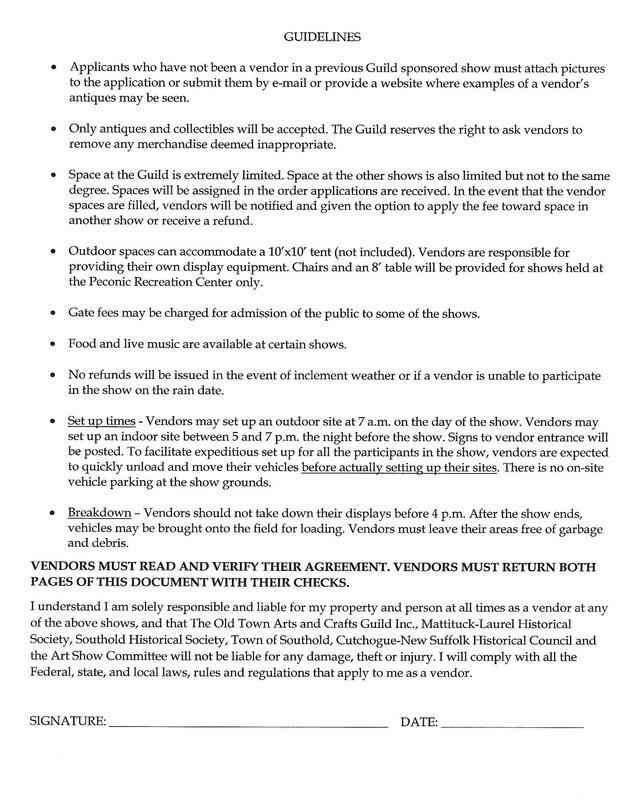 The following application is to be used by Antique Dealers only for any or all of our shows for the 2019 season. Print each page separately! To obtain this application, right click on the page. Then click on "view page." The page should appear on your computer. Print page. If the page prints smaller than a regular page, change the "scale" to 125% and reprint the page. For Mac users, right click on laptop, hold 2 fingers on the touch pad, then select "Print." If you are unable to print the page, send an email to oldtownguild @aol.com and we will gladly send you this application. PLEASE NOTE: The August 17th show at the Peconic Rec Center Annex is OUTDOORS, not indoors.